Are you running low on disk space? Is your Windows PC feeling a bit slow? 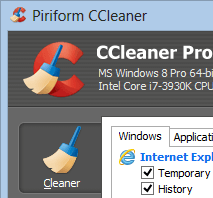 Use CCleaner to optimize your computer and clean up any unused resources for a faster, cleaner PC. Why should I clean my PC? As you use your Windows PC, files and settings are stored in directories. This can cause your computer to become slow, or to run low on available disk space. Cleaning your PC regularly can help it run quickly, and can free up disk space. How to clean my PC? CCleaner is the number one PC cleaning software and is trusted by thousands of people and companies worldwide. The simple interface allows you to analyze and clean your Windows PC with ease. "Cleaning your PC regularly using CCleaner can help it run quickly, and can free up disk space"
Why not give CCleaner a try today and see how easy it can be to clean your Windows PC.